Let’s talk about a phenomenon that involves the mysterious deaths of animals in the masses all around the world. It’s one of the most underreported signs of God yet. 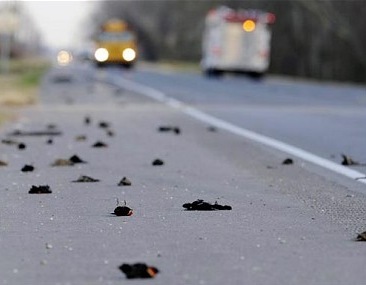 Around midnight on New Years Eve, thousands of blackbirds suddenly started dropping dead out of the sky in Arkansas and were left scattered all over the place. Scientists are arriving at conflicting answers to this bizarre phenomenon, saying that fireworks might have caused them to fly into each other and into power lines. As a cover story, the USDA has also claimed responsibility for this incident and many other mass animal poisonings in the US; not a very good cover if you ask me, because remember, this is an occurrence that has been taking place all over the world, not just in the US. For instance, Around the end of January last year, 10,000 cows and buffalo unexplainably died in Vietnam, and around the same time that month, 200 cows were also found dead in Wisconsin in the same unexplainable manner. Now, we’re seeing approximately 5000 blackbirds fall dead from the sky for the second New Year’s in a row. We know that fireworks couldn’t be the cause of this, because this does not occur solely on New Year’s, but around this time of the month, as we saw mid-January last year when 300 grackles dropped out of the sky in Alabama, and in the Italian city of Faenza, the carcasses of 700 turtledoves piled up over 5 days. It doesn’t take a rocket scientist to figure out that when this doesn’t happen every time there are fireworks, it’s not the fireworks, otherwise you’d get half the sky falling on the 4th of July. Nick Nuttall, a spokesman for the UN Environment Program, said that there was no sign that these animals are dying from diseases. Because this oddity is so new to the world, there are still many theories at debate. At the same time as the death of the blackbirds, around midnight on New Year’s Eve this year, an estimated 20 tons of dead herring fish also washed up on the coastal beaches of Norway, and before the locals could figure out a solution to get rid of them, the mass of dead fish vanished before the next day. Many think the tide may have simply washed these fish back into the ocean, but it was noted that the fish had washed up past the point of high tide. Let me just clarify something, half a million fish don’t just wash up dead somewhere and vanish within hours without a trace. The reason nobody’s finding any answers to properly explain what’s going on is because the truth is not something that scientists want to hear. The Bible has a clear answer for us in Hosea 4:1-3. It says, “Hear the word of the LORD, ye children of Israel: for the LORD hath a controversy with the inhabitants of the land, because there is no truth, nor mercy, nor knowledge of God in the land. By swearing, and lying, and killing, and stealing, and committing adultery, they break out, and blood toucheth blood. Therefore shall the land mourn, and every one that dwelleth therein shall languish, with the beasts of the field, and with the fowls of heaven; yea, the fishes of the sea also shall be taken away.” Isn’t it interesting that the only animals that are mysteriously dropping dead are cattle, birds and fish, the three animals mentioned in this prophecy. It says that God will cause this to happen because we’ve rejected God and because we’ve followed our own wicked ignorance. I’m writing this because I feel a sense of importance about this message, like God is urging me to warn people to not be fooled by skepticism, but to acknowledge a sign when they see one. The Lord personally confirmed this message with me the night that I first heard about the dead birds by showing me one of them. It happened when I went out to take a walk for some fresh air at about 1 o’clock in the middle of the night, as I often do. As soon as I stepped out of my apartment building, there was a pigeon sitting on the ground in the middle of the entranceway. I quickly realized that it wasn’t just sitting down, it was sitting dead, square in front of the front door. I must have been the first person to see it, and it was gone by morning. What struck me as odd about this is the fact that I see a dead bird maybe twice or three times a year at the most, and here I find one practically sitting on my doorstep a day after the Arkansas incident, and mind you, I saw this pigeon on January 1st, the day that I spent all day researching bird migration to write you that recent article Year of the Dragon. I believe that the Lord God is sending his final warnings to turn back to him and revive our faith in His word as he continues to astound us by fulfilling prophecy within the very first hour of 2012.